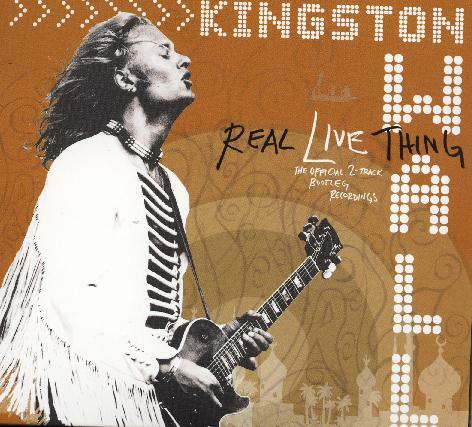 Kingston Wall - "Real Thing Live"
Kingston wall are now a full on cult band from Finland. They were probably the greatest psychedelic rock band ever from Finland and one of the best in the world. Sadly, their career was cut short when guitarist and singer Petri Walli took a fateful jump from the top of Helsinki's tallest church (hoping that he could fly). I just wish that he would have flown. Anyway, that was in 1995 and now in 2005, bassist Jukka Jylli, dug down into his archives of live Kingston Wall concerts that they performed from 1992-1994 and has unleashed 3 hours of live Kingston Wall. While these are all 2 track soundboard tapes, the sound quality is very good (Although the drums are a bit loud at times. But Sami Kuoppamäki is one of the best rock drummers of all time, so no complaining! The first CD opens with the amazing track, "With My Mind". A lot of material from the Trilogy CD is featured on this CD and Petri wails on the guitar and sings with passion. Petri just plays amazingly passionate guitar on tracks like "Time" and "Could It Be So". The CD closes with an excellent 13 minute version of "Waste of Time", which includes a drum solo by Sami. The second CD begins with a long version of Nepal, an extended didgeridoo intro and awesome guitar playing. The majority of this CD is taken from the 1993 tour I am quite sure and features a lot of great tracks like "And I Hear You Call", "Used to Feel Before" and "Shine on Me", which features a guest Saxophone solo by Sakari Kukko. "You" shows Petri really showing his amazing feeling on the guitar and really demonstrates what a loss it was too lose this guy so young. He was an amazingly passionate guitar player as well as singer. The CD ends with the instrumental "Palékastro", which shows the Hendrix influence on Petri and shows the whole band playing cool stuff. Jukka lays down some killer bass lines and Sami, well, he is one of the best rock drummers ever. CD 3 begins with "The Skies Are Open", which is a jam sort of song that they opened some of the '94 shows with and was never recorded on the studio records. Killer stuff. The highlight of disc 3 is the amazing version of "On My Own" that runs into "We Cannot Move" and "It's all Happening". These 3 tracks just blow me away. A friend Tommi plays keyboards on "The Real Thing" and "The Answer". The CD ends with the funny track, "Have You Seen the Pygmi-mies", which is acoustic and sounds like it was recorded on the side of the road while on tour. Amazing 3 CD set. Please release some more.